Arizona’s election problems showed the disastrous consequences of gutting the Voting Rights Act. Alejandra Ruiz went to vote on her lunch break in downtown Phoenix during Arizona’s March 22 primary. A registered Democrat of Mexican-American origin, Ruiz had recently moved to Maricopa County. Because downtown Phoenix had only one polling place for thousands of residents and the line was too long, she decided to vote at a different polling place after work. But things were even worse when she arrived at the West Thomas Baptist Church polling place at 6:30, located in a predominantly Hispanic neighborhood on the city’s west side. Ruiz waited nearly six hours to vote, finally casting her ballot at 12:07 am, more than five hours after the polls closed. When she left there were still at least 100 people still waiting in line to vote. Leslie Feldman, a 34-year-old mother of two, waited nearly five hours in line with her 3-year-old daughter and 12-week-old baby. The toilets were clogged and there was sewage leaking on the grass where hundreds waited to vote. When she finally got to the front of the line, poll workers had run out of Democratic ballots. “For the very first time in my life, I was starting to feel disenfranchised,” Feldman wrote. 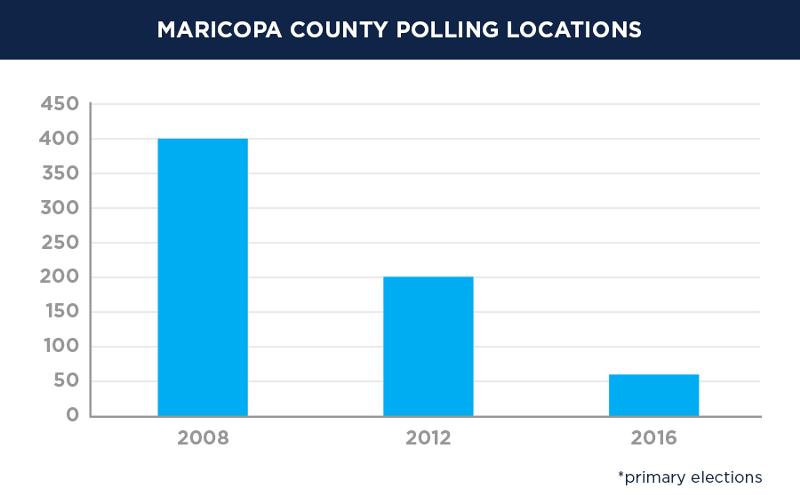 Tens of thousands of residents of Maricopa County waited hours to vote in the March 22 primary because election officials reduced the number of polling places by 70 percent, from 200 polling sites in 2012 to just 60 sites in 2016. The lines have become the clearest symbol of America’s electoral dysfunction in 2016. Others weren’t able to vote at all. Mercedez Hymes, an African-American registered Democrat, went to vote at the Bell Recreation Center at 6 pm. When she saw the line wrapped around the block, she drove to another polling place where she hoped the lines would be shorter. But the line at the Church of the Advent was even longer. So she drove back to the Bell Recreation Center, but was unable to find any parking because there were so many people waiting to vote. By the time she found a spot, it was after 7 pm and the polls were closed. Hymes was unable to cast a ballot. The same thing happened to Cleo Ovalle, who made three trips to the polls but never got to vote. First she visited the Church of the Beatitudes at 4 pm, but had to leave without voting to pick her son up from school. She went back to her polling place, but the line had grown even longer. She visited a different polling place at 6 pm, but there was no parking, and after trying for 20 to 30 minutes to park, she realized it would take hours to vote and she would need to be back home to take care of her son. She, too, left without voting. Now Democrats, including the presidential campaigns of Hillary Clinton and Bernie Sanders, are suing Arizona on behalf of these voters to make sure there isn’t a repeat of the five-hour lines during the November general election. “Alarmingly inadequate number of voting centers resulted in severe, inexcusable burdens on voters county-wide, as well as the ultimate disenfranchisement of untold numbers of voters who were unable or unwilling to wait in intolerably long lines to cast their ballot for their preferred presidential candidate,” the lawsuit states. In primarily Anglo communities like Cave Creek, there was one polling place per 8,500 residents. 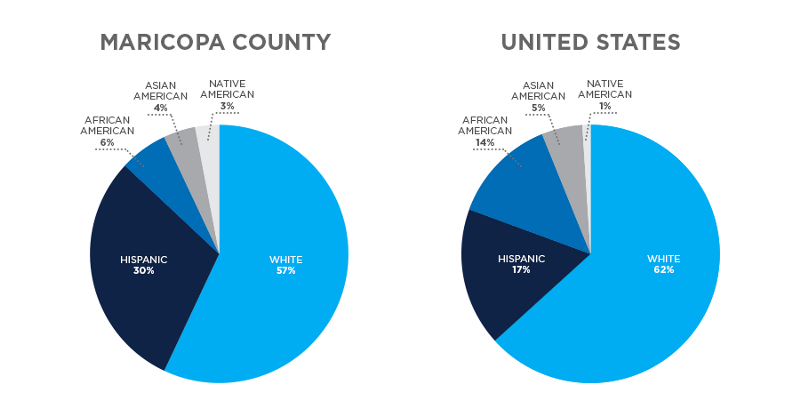 In Phoenix, a majority-minority city where 40.8 percent of its 1.5 million residents are Hispanic, there was only one polling place allocated per 108,000 residents. Previously, Arizona was one of 16 states that had to approve its voting changes with the federal government under Section 5 of the VRA because of a long history of voting discrimination against minority voters. But after the Supreme Court gutted the law in 2013, states such as Arizona were free to make election changes, like reducing 70 percent of polling places, without federal approval. The five-hour lines in Maricopa County were a direct consequence of the Court’s Shelby County decision. Maricopa County has pledged to have 724 polling places for the November general election, 12 times as many sites as in the primary. So hopefully this problem will be resolved without judicial intervention. However, because of a weakened VRA, one never knows where the next problem will occur. Few realized that Maricopa County had closed so many polling places until voters faced horrific lines and demanded answers. Moreover, there are other problems in Arizona that remain unaddressed. The state rejected the fifth-highest number of provisional ballots in the 2014 election. During the March 22 primary, 20,000 of 24,000 provisional ballots were thrown out in Maricopa County, because registered independents were not allowed to vote in the closed primary or wrongly had their registrations changed by the DMV or voters showed up at the wrong precinct. That means some voters waited five hours to vote, only to not have their ballot counted. 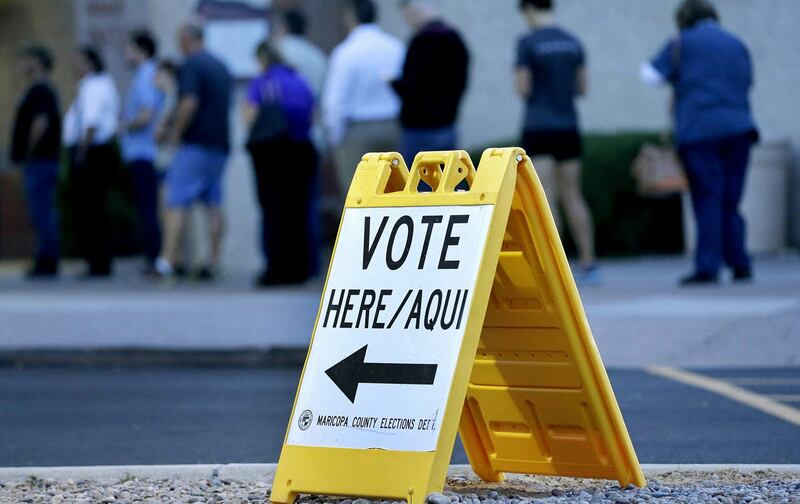 Arizona also recently passed a law making it a felony for someone to turn in a sealed absentee ballot to the county registrar on behalf of another voter, which had long been done to help Hispanic, Native-American, and African-American voters. It’s good that leading Democrats like Clinton and Sanders are seriously confronting the country’s erosion of voting rights. As I’ve written many times, 2016 is the first presidential election in 50 years without the full protections of the VRA, and 17 states, including crucial swing states like Wisconsin and North Carolina, have new voting restrictions in effect since the 2012 election. Despite this disturbing trend, there has not been a single question about voting rights in 21 presidential debates. This weekend thousands of activists from across the country will gather in Washington for Democracy Awakening to demand that the VRA be restored and the distorting influence of big money be reduced. And next week Congressman John Conyers, the ranking Democrat on the House Judiciary Committee, will hold a hearing on the urgent need to protect voting rights. “Whereas voting rights were ascendant in 1966, voter-suppression tactics are spreading in 2016,” Conyers and Barbara Arnwine wrote in The Nation. The problems in the primary will be greatly magnified in the general. The potential for a repeat of Florida 2000 could arise in half a dozen states. We need to act now before it’s too late.